Graham Buckingham with the monthly mug for March. This track as always was in great condition and at 1000 baht green fee is real value. The greens normally slick were a tad slower today, with many 3-putts being the norm. 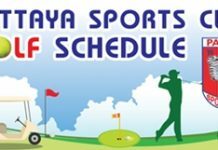 Of the eleven golfers placed in the regular 18-hole stableford competition, the scores were packed tightly together and the organizers had their hands full dealing with five countbacks. The top spot in A flight (0–13) went to Bill Steinman’s 36 points from his handicap of 12. Second was Alan Sullivan (13) with 35 points, on countback over Brian Parish (13). John Davis had the top nine-hole score among non-placers with 19 points. The B flight (14–20) had fewer players, and therefore only two placings. Andre Van Dyk followed up his Friday win with another strong performance and today was first again with 37 points. Brian Gabe secured second with 35 points while Bob Britton had the top nine-hole score with 19 points. In the C flight (21-23), Frank Xin (23) was first with 37 points on countback over Walter Baechli (21). Kae Dayton (23) claimed third with 35 points and Carole Kubicki had the best nine-hole score with 19 points, on countback over Buckers. In the D flight (24 and up), Don Carmody (27) was first with 37 points and Roy Dayton (27) was second on 36, edging a countback over Dave Cooper (24). Barry Elphick had the best nine-hole score with 16 points, over Karen Brown on countback. It was time again for the popular Tropical Golf Monthly Mug comp – playing “modified medal” (max double par) where course strategy and risk/reward top the decision list. Medal play also forces a bit of self-honesty, “Can I really pull of that 200 yard shot through the trees and over the water”? Better to get a double bogey than double par to stay in contention. Pattavia was the destination, the course was in fine condition and the greens (mercifully) were a little slower. One reason why became apparent just after the turn when the rain came down, and how! We lost about an hour of time but the course drained rather well and play continued without much difficulty. Graham “Buckers” Buckingham won the mug by a single stroke over three other players, saving a rather difficult countback. Graham shot a net 71 off his 23 handicap and as this was his third mug it seems he’s building up a nice collection. As to the rest of the winners, the scores were a bit high in some cases, but some said the rain delay upset their winning rhythm. Mashi Kaneta topped the A-Flight (0-15) with a net 72 ahead of Rob Brown (73) and Tom Herrington (76). In B-Flight (16-22) Paul Weatherley was the winner on net 72, while Mick Coghlan was second on net 77 and Andre Van Dyk third a further shot back.